Failed oilman turns assassin! Not finding his fortune in the booming oilfields in the Union, did this once popular actor seek fame as a martyr to the Confederacy? John Wilkes Booth’s dreams of Pennsylvania oil wealth ended in July 1864. Photo by Alexander Gardner courtesy Library of Congress Prints and Photographs Division. As the Civil War approached its bloody conclusion, in January 1864 John Wilkes Booth made the first of several trips to Franklin, Pennsylvania, where he purchased an oil lease on the Fuller farm. Maps of the day reveal the three-acre strip of land on the farm, about one mile south of Franklin and on the east side of the Allegheny River. A small marker can be found at the site where he drilled an oil well, which is about 21 miles south of another marker – and museum – where the first commercial U.S. oil well was drilled by Edwin Drake. Drake’s August 27, 1859, discovery launched a drilling boom that made newspaper headlines (the industry’s first “dry hole” a few days later did not). The 1863 theater season had brought a handsome, 24-year-old aspiring actor the fame he had long pursued. For years, he had struggled in the shadows of his renowned thespian father, Junius, and brothers, Edwin and Junius, Jr.
John Wilkes Booth had opened his stage career in 1855 at the Charles Street Theatre in Baltimore and became a member of the Richmond Theatre in 1858. Unlike the rest of his family, he would become a Confederate sympathizer as audiences in Richmond adopted him as one of their own. They loved the energy he brought to his Shakespearean performances – his sword fights and dangerous leaps from balconies. John Wilkes Booth made his first trip to the oil-boom town of Franklin, Pennsylvania, in January 1864. He purchased a 3.5-acre lease on the Fuller farm. Popular success followed on stages in Baltimore, New York, and Boston. “Star of the first magnitude,” “the youngest star in the world,” and “the most handsome man on the American stage” became commonplace praise in theatre columns. Booth’s meager fortunes changed and after years of just getting by, he suddenly found himself earning $20,000 in the theater season – the equivalent of over $300,000 today. 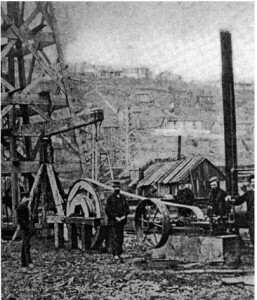 The typical Venango County drilling site used steam power to lift and drop heavy cable-tools and included a “walking beam,” at left. In late 1863, Booth performed at the Cleveland Academy of Music, managed by his friend John Ellsler. With local news-papers full of tantalizing stories of the oil boom in Venango Count, Booth convinced Ellsler and associate Thomas Mears to join him in a new investment. In January 1864, Booth made his first trip to Franklin, Pennsylvania, where much of the oil excitement was centered. There he purchased a 3.5-acre lease on the Fuller farm. Between Thomas G. Mears of the city of Cleveland, State of Ohio, and Teresa Wilhelmina, his wife, parties of the first part, and Joseph H. Simonds of the Borough of Franklin, County of Venango and State of Pennsylvania, in trust for himself and John A. Ellsler of the city of Cleveland, State of Ohio and John Wilkes Booth of the city of New York, to be held as part for the sum of $4000 lawful money of the USA all that certain piece or parcel of land situate in the township of Cranberry, County of Venango, and the State of Pennsylvania. Booth drew his last paycheck as an actor on May 28, 1864 — to focus exclusively on the oil business. Today, the streams and parks Venango County’s “Valley the Changed the World” are popular with tourists. The Dramatic Oil Company hired an experienced driller, Henry Sires. When first introduced to John Wilkes Booth at a typically grimy field location, Sires apologized for his oily handshake. “Never mind, that’s what we are after,” replied Booth. They named their first well Wilhelmina in honor of partner Thomas Mears’ wife and drilling began in the summer of 1864. The well proved costly and difficult, but a depth of 1,900 feet, to the partners’ delight, it came in as a producer. Although the price of crude oil often fluctuated greatly, that summer it was selling for about $16 to $20 a barrel. Believing his fortune would be made in the Pennsylvania oilfield, Booth drew his last paycheck as an actor and left the Boston stage on May 28, 1864, to focus exclusively on his oil business. By June of 1864, Booth had invested another $1,000 of his now substantially diminished cash for a 1/30 share in a Boston Oil Well Company lease (later Botolph Oil & Mining Company) on Hyner farm of Pithole Creek. Meanwhile, the Dramatic Oil Company’s Wilhelmina well was producing about 25 barrels of oil daily – but was beset with problems and mounting costs. Booth and his partners finally determined that “shooting” their well could increase its production. At the time, this technique required that a large quantity of black powder be detonated deep in the well. John Wilkes Booth left Pennsylvania in July 1864 – and began the conspiracy that would end with President Lincoln’s assassination nine months later. Image courtesy Library of Congress. John Wilkes Booth’s dreams of Pennsylvania oil wealth abruptly and permanently collapsed. He had lost over $6,000 in the Wilhelmina well. Booth left the oil region in July 1864 – no longer the wealthy entrepreneur he had been just 18 months earlier. A few weeks later, Booth checked into Baltimore’s Barnum Hotel. In this hotel, the Lincoln conspiracy first began to take shape with Booth’s boyhood friends and former Confederate soldiers, Michael O’Laughlen and Samuel B. Arnold. Over the next eight months, the plan would evolve from kidnapping to assassination, culminating in Ford’s Theater on April 14, 1865, when Booth assassinated President Abraham Lincoln. His own life ended with a bullet when the Union cavalry caught up with him 12 days later, about 60 miles south of Washington, D.C.
Two months after John Wilkes Booth’s death, a large discovery occurs on the Hyner farm of Pithole Creek. The “Homestead Well” will yield 500 barrels of oil a day – and makes many fortunes. History is left to wonder what path Booth and the nation might have taken, had only his venture into Pennsylvania’s booming oilfields succeeded. Learn more about the history of shooting a well in Shooters – A “Fracking” History.